Giveaway: Red Shoe Crawl 124 Street Tickets! I remember spending weekends in Chinatown with my parents as a kid. It was always busy; parking was hard to come by, and the sidewalks were lined with people shuffling from shop to shop. At the time, I’m not sure I understood why my Mum would drag us to four seemingly identical grocery stores, but now, I understand it was not only the price differential, but the fact that each establishment offered a particular specialty that was worth seeking out. 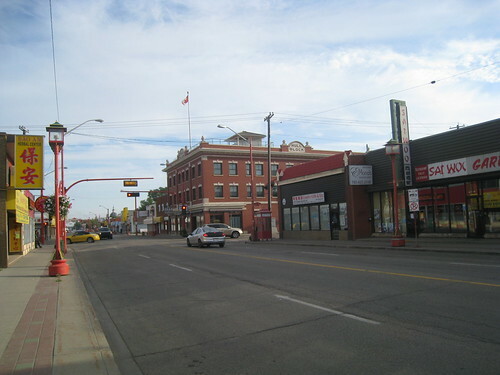 In my teenage years, I accompanied my parents on their errands less and less, though on the odd occasion out and about in Chinatown, it was evident the neighbourhood was changing – businesses once vibrant were shuttered, buildings were falling into disarray, and the streets were noticeably quieter. I’m sure the opening of megastore T & T didn’t help matters, offering convenience and easy parking, but the visual aesthetics of Chinatown – neglected and unkempt – probably also didn’t do much to boost the image of the district. Five years ago, I began to rediscover Chinatown. My office is within walking distance of the main shopping hub, and at lunch time and after work, I’d pop over for a bowl of pho at Pho Tau Bay, a banh mi from Nhon Hoa or pick up a box of buns from Garden Bakery for breakfast. For Asian groceries, Lucky 97 is my first stop, while Ying Fat meets all of my tofu needs. And though not Asian at all, the Italian Bakery is my go-to deli. You can now find me in Chinatown at least once a week, eating, shopping and appreciating a neighbourhood that is still very much pedestrian-oriented. We now celebrate streets like the 104 Street Promenade and 124 Street for their walkability, independent businesses and diversity – but what about Chinatown? The area has made some strides in recent years, adding Urban China, and its new sister eatery Urban Shabu, which have helped draw crowds as destination restaurants. The Wild Rose Circle Project, with housing and retail, is finally under construction, and the McCauley Revitalization Strategy continues on. 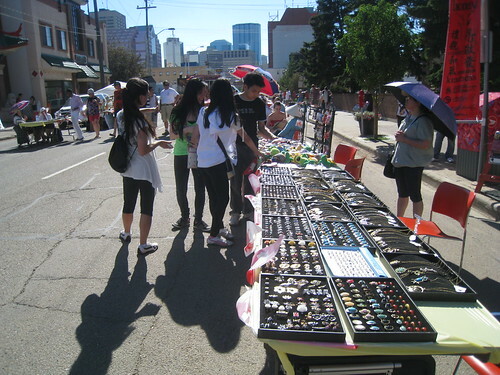 But in the short term, what else can be done to encourage Edmontonians to discover or rediscover their Chinatown? I am part of a new group called Our Chinatown. 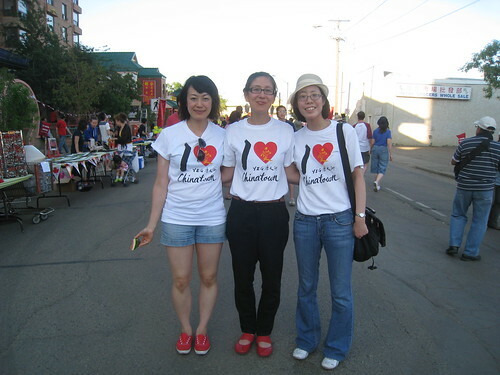 We are a group of young professionals working to revive Edmonton’s Chinatown – reclaim its heritage, embrace its present and imagine its future. As our inaugural event, we are organizing a night market as a way to create a lively, energetic gathering that inspires a new vision for the neighbourhood. Building on the success of the Heritage Night Market organized by the Chinese Benevolent Association on July 1, 2013, our market will set a different tone, anchored by a DJ and three food trucks. We’re thrilled to have The Lingnan Express, Molly’s Eats and Swich offer Asian-inspired dishes, which will include ever-popular night market items like curried fish balls, green onion cakes and oyster omelettes, and modern takes on Asian cuisine such as Korean smoked meat and matcha ice cream sandwiches. Gama will also be serving up bubble tea! Check out the menus here. Besides food, vendors also form the cornerstone of night markets, and we’ve assembled a great selection of items for your shopping pleasure! You will find everything from accessories to clothing, CDs and movies, toys and stationary to hand-made art and keepsakes. We’re also excited that a few young performance groups will be on hand for entertainment. 5 Elements Drums and Lion Dance Crew will help us kick off the market at 6pm, and at 8pm, Convergence Dance Crew will bring us their best K-pop dance covers! I had the pleasure of watching Convergence at this weekend’s Heritage Festival – they just nailed Psy’s Gentleman! For those who are interested in learning more about Chinatown’s past, present or future, we have also lined up several tours on the history, future development and artistic side of the neighbourhood. The schedule will be posted on the website on Tuesday. August 17 is shaping up to be a Chinatown equivalent of Downtown’s Super Saturday. The Edmonton Dragon Boat Festival rocks the North Saskatchewan River from 9am-5pm in Louise McKinney Park, while the 5th Annual East Meets West Festival runs 11am-8pm on 107 Avenue and 99 Street. End your day at the 97 Street Night Market from 6-10pm. We hope you’ll join us in (re)discovering our Chinatown on August 17!